So apparently there is a heat wave around Europe...yet here we are having Spring weather. I probably shouldn't be saying this because the heat is coming back. Actually it's a good thing because this year I really want to go to the beach and maybe tan a bit ( no worries, I already have a potent SPF with me, I'll probably do a SPF post later). I really want to enjoy going to the beach and pool with friends this summer. It's not something I usually do but, there's always a first time right? Also, guess who got two packages held by custom services...Like seriously, one of the packages comes from the Netherlands, why did they even spot it? What bugs me even more is the fact that I have to wait extra time to get my stuff. 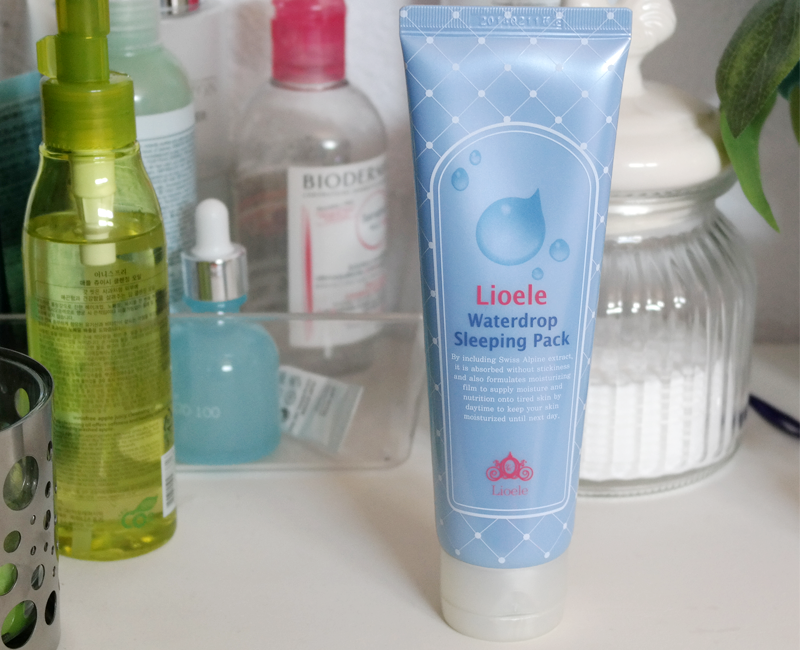 Now, post-wise, I'll be talking today about the Lioele Waterdrop Sleeping Pack. There has been a "Sleeping-mask" craze around Europe right now. Ever since The Body Shop launched their Sleeping Mask and Caroline Hirons started to talk about the Mizon Star fish cream ( Mizon and other brands are now stocked in Europe by Cult Beauty but things cost 3 times more than what they cost in Korean and Online Beauty shops...even with me counting on custom taxes), there has been interest here around this department. Personally, I had been thinking about getting this product for awhile since I friend got it for herself and liked it a lot. I got the change to try out a sample and the final decision was made. This is a king-size tube. I mean, I can slap this across my face everyday and I bet that I'll only need to get a backup next year. It's true that it's not travel friendly but seriously, brands usually don't have that in mind when making everyday products like this. Specially when they deliver samples or you can depot a bit whenever you travel ( it's not that hard I think). I've been using this on a daily basics and I really can see an improvement on my face and how this helps to make it look more healthy and moisturised in the morning. It kinda amplifies the potency of my regular night moisturiser. Also, it's not really thick and it sets/sink into the skin really quickly, not leaving that greasy feeling that might be quite uncomfortable for some people. I usually only use a small pea-size, there is no need to use more than this. Not only this doesn't leave the sticky/greasy feeling as mentioned before, it has a cooling sensation as well. Quite relaxing actually. Overall, I do recommend this product without thinking twice. I got it for 15$ I believe at Jolse.com and I'll probably repurchase it. Considering that I'll only need to do that next year. And now I'm off to prepare another posts. I mean, after so much time without post, I'm really making an effort to post more now during July and August.Next I'll probably talk about the Zoeve Rose Golden Palette - who's ready for that?